NASA's Mars rover Curiosity carries five cylindrical blocks of organic check material for use in a control experiment if the rover's Sample Analysis at Mars (SAM) laboratory detects any organic compounds in samples of Martian soil or powdered rock. The blocks are carried on the front of the rover, within reach of the sample-collecting drill on the rover's arm, and are sealed under foil until needed. This image centered on the foil that covers one of the bricks was taken by the rover's Mars Hand Lens Imager (MAHLI) during the 34th Martian day, or sol, of Curiosity's work on Mars (Sept. 9, 2012). The image has been rotated to compensate for the tilted orientation of the camera when it was taken. The diameter of the covering is about 2.5 inches (6.5 centimeters). The rover's UHF radio antenna, mounted on the rear of the deck, is the feature in the background resembling a miniature water tower. 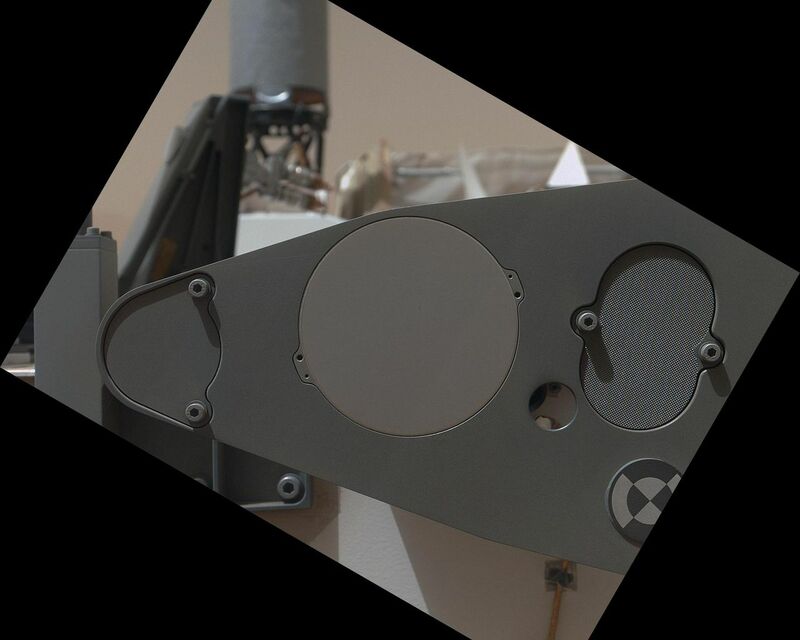 The Sol 34 imaging was part of characterization testing of the rover's arm. This image checks the precision of the arm's positioning as if preparing to collect a sample of the check material. 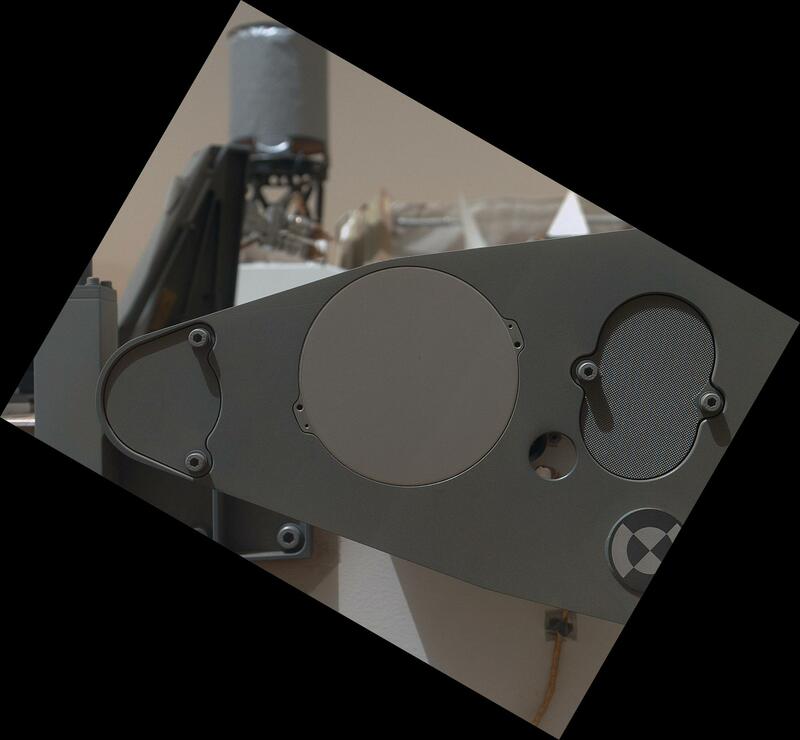 The darker, oval-shaped feature to the right of the foil covering and a rounder dark feature to the left are touch points for the rover's drill to use when the drill collects a powdered sample of the organic check material later in the mission. If SAM does detect organics, one challenge will be to confirm that these molecules are truly Martian, not stowaways from Earth carried to Mars on Curiosity. The organic check material is a silicon-dioxide ceramic laced with small amounts of synthetic fluorinated organic chemicals not found in nature on Earth and not expected on Mars. The basic control experiment will collect a powdered sample from an organic check block with the same drilling, processing and delivery system used for collecting samples from Martian rocks, and then will analyze the sample with SAM. If SAM finds any organics other than the fluorine-containing markers, they will be stowaway suspects. If only the markers are detected, that would verify that organic-detection is working and that the sample-acquisition and handling pathway has passed a test of being clean of organic stowaways. That control experiment can assess characteristics of organic contamination at five different times during the mission, using the five bricks of check material. 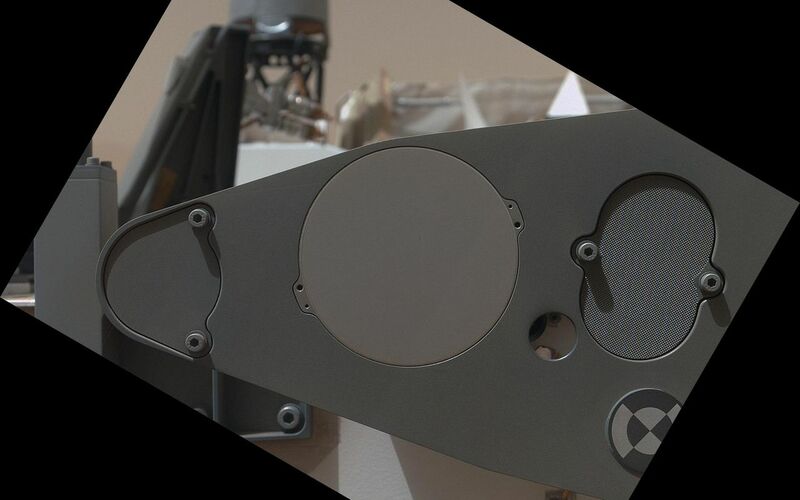 The main purpose of Curiosity's MAHLI camera is to acquire close-up, high-resolution views of rocks and soil at the rover's Gale Crater field site. The camera is capable of focusing on any target at distances of about 0.8 inch (2.1 centimeters) to infinity, providing versatility for other uses.